Photography is one of those activities where having the right equipment can really make a difference. That’s not to say that it is the ONLY thing that’s important, but having the best tools can help unlock the best results. Our equipment is the best. We use only Canon DSLR bodies and pair them with the highest quality Canon L lenses and top it off with Canon Professional Speedlites. We’ve invested in high quality equipment because we know it makes a difference and our paying clients deserve the best. With most of this equipment it is hard to show what a difference it makes in a side by side comparison. But there is one piece of kit that somewhat speaks for itself. The lens that we use for traditional photos is a remarkable tool. Put simply, it is the widest (opposite of zoom) lens available commercially. What this means is that we can capture more of each room in a single photo, helping buyers to imagine themselves in your listing. Instead of choosing which part of a room to capture, our professional wide-angle lenses can capture the entire room in one picture. Without any distortion or “fisheye” effect ruining the photo. Most consumer cameras have a lens width of 35mm. This makes it almost impossible to show off even half of a room in one photo. This forces buyers to scroll through multiple pictures to try and see what a room really looks like. And if you’re pictures don’t upload in the correct order, or if they are not taken carefully you can create a real maze. We use a Canon 11-24mm L lens to capture more of every room. This means that rooms are presented in full, not just in pieces. And smaller rooms like bathrooms and offices can be presented to buyers in a way that is otherwise impossible. 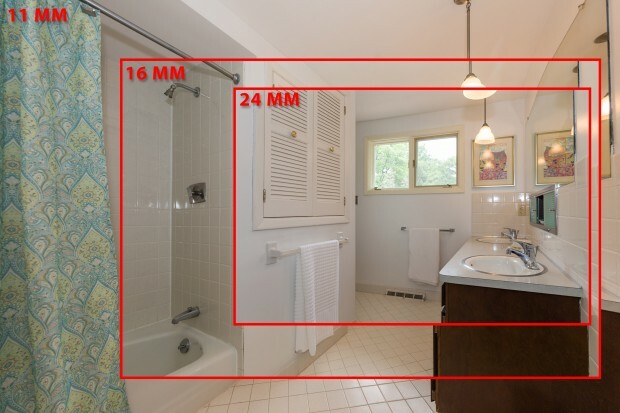 Here’s a direct comparision of the same bathroom in a listing. Notice how in the 11mm version you can see the bathtub, the tile floor, the light fixtures and everything in between. Then compare that to the limited view of the 16mm or 24mm image that cuts those details away. Here is a composite of all three images that shows just how much more you can see in the Ultra Wide 11mm version.